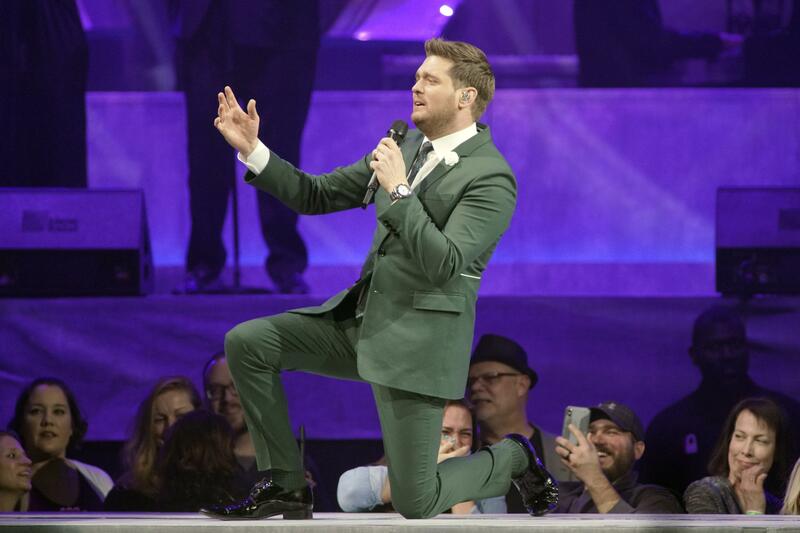 UPDATED: Wed., April 10, 2019, 10:09 p.m.
ABERDEEN, Wash. – When world-renowned singer Michael Buble singled out Aberdeen 17-year-old Ben Fagerstedt to sing with him Saturday night in front of 18,000 people at the Tacoma Dome, it was a dream come true for the teenage singer who ranks Buble as second only to Frank Sinatra as a musical inspiration. Fagerstedt already has a lot of fans locally from school and recital performances and he is the current state champion in the baritone division for the Washington Interscholastic Activities Association. As a Christmas present, Fagerstedt received VIP tickets to the Buble concert, which meant he got to stand in a pit area directly next to the stage. In the VIP room before the show, the other concertgoers were made aware that Fagerstedt was a singer and idolized Buble, so they cheered for him when Buble asked for audience participation. When Buble asked what Fagerstedt wanted to sing, he didn’t hesitate and requested the Sinatra classic “I’ve Got You Under My Skin.” Buble took the first half line and handed the microphone to Fagerstedt and the two sang harmony at points. Fagerstedt added that last December at the Hoquiam Brewery was his first time singing in public, but he has won other awards for singing, including the state WIAA title in the baritone division. Most of his family is musically skilled as well, and his mom serves as the worship leader at Foursquare Church in Central Park. In the video, Buble holds up a sign by Fagerstedt that reads, “Dream Come True – Sing With You?” along with an unflattering picture of Buble’s face squinting. Fagerstedt fibs that his mom made the sign, and the two both joke about their last names before he picks the song that became a signature for Sinatra. The band accompanied Fagerstedt, who was surprised and thought it would be just a capella, and the song appears to go smoothly, with Buble sitting cross-legged and clapping along, sometimes joining in to sing a harmony part. At the end, Buble holds up the teen’s hand and got an applaud chant going. Up in the nosebleed seats, Fagerstedt’s dad, Joe, and mom, Allison, watched with excitement, Joe said. “As a dad who wants their son to have success, it’s a pretty neat moment,” Joe said, who added that Ben made sure to pick a song out beforehand so he didn’t miss his chance like some previous audience members who couldn’t think of one in time. In the future, Fagerstedt said he would like to form his own singing group, and hopes to continue pursuing a career as a singer. “It would be such a hole in my life if singing wasn’t there,” he said. Published: April 10, 2019, 9:08 p.m. Updated: April 10, 2019, 10:09 p.m.